If you are looking for great Christmas gift idea's for your favorite crazy quilter, here are two great idea's. If you are a regular reader of my blog, you know that I am involved in making a crazy quilt for the MCC sale every year. To raise money to make the next quilt, we sell calendars featuring pictures of the quilt. 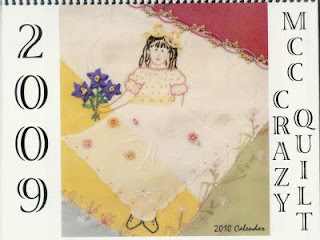 This calendar features the 2009 Crazy Quilt, but it is a 2010 calendar. We would really appreciate it if you would buy one to help us out! As you know, a crazy quilt is not a cheep venture! This year's theme is a Valentine Crazy Quilt. 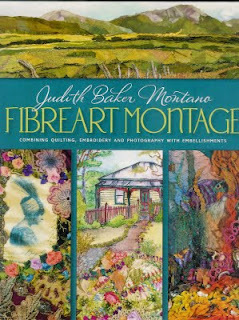 Another great idea would be Judith Baker Montano's new book Fibreart Montage. When she was here in November, she sold all 36 of the books she brought! It is an amazing book that is oversized and is spiral bound so it can open flat. Both of these items are available on my website, www.valeriebothell.com. I also did a little subtle plug for your retreat. When I get more done on my projects started there, I'll do more. I enjoyed the retreat very much, and it's within easy driving distance from me.